First of all, I want to say thanks for your vote of confidence regarding my last post. You guys rock! I'll keep ya posted on that project. So a few weeks ago I did a post on pantries. If you missed it, you can read it here. And in that post I stated that I wanted to see your pantries. So I got several of you to show me. And now I'm passing them on to the rest of you. First up, Mary Ann of Classic Casual Home. Before we begin, I must show you her kitchen. The first time I saw this I think my jaw literally hit the floor. I love everything about it. Okay, now with that out of the way, here's her pantry. What Mary Ann loves about her pantry is that it houses all of her small appliances. She has it set up so that she doesn't even have to drag them out when needed--she just plugs in the needed appliance in her pantry and gets the job done. What a great way to keep your countertops free of space-hogging appliances! You can check out more of her fabulous home here. Next up, Marianne from Marianne Simon Design. Now this is not her pantry but one that she would love to have. Wouldn't we all? It's like a little kitchen showcase in there. I could sit on that stool and just stare at all the pretties for hours. Next on the list: Marci from Timber and Lace. Marci loves the look of a well organized, neat pantry with beautiful containers displaying all her food, but with three children, that's hard to keep up. So her solution: baskets. 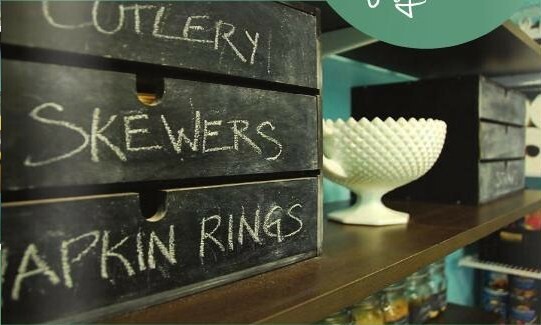 She simply places her boxes of dry goods in baskets, attached a wooden plaque painted with chalkboard paint so everyone knows what's inside and she's good to go. 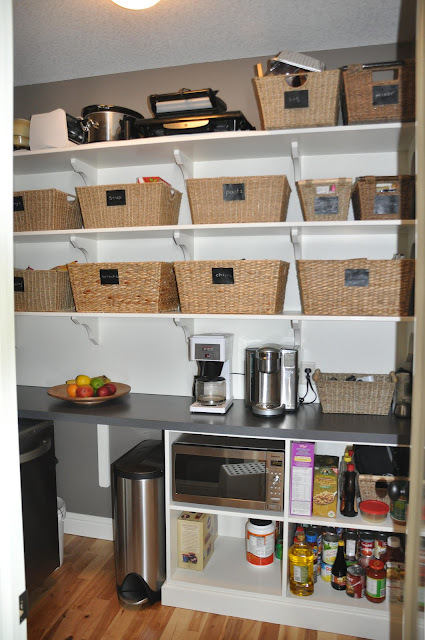 And has a beautifully organized pantry to boot. Great work, Marci! You can read more about her pantry here. Janell, from Max and Isabella Rooms and editor of the brand new e-zine House of Fifty, just had an article on pantries in the premiere addition of House of Fifty. Included were some handy tips when planning a pantry. #1. Edit and organize. Take everything out and decide what you really need and/or use and make items you use everyday readily accessible. And #2. Mix it up. Having varying heights in your shelving makes it possible for you to customize to your specific needs. This is my friend Ruth's pantry. It's a U-shaped walk-in that she designed when she and her husband built their home. It was something she insisted on and wouldn't budge with--which meant it couldn't be located in the kitchen (due to design issues), but it's not far away. So you can have a pantry in any part of your house. Be creative! Ruth also does a lot of canning so this is the perfect spot to stash those goodies. And now finally, my own pantry. Let me give ya a before so you get an idea of how bad it really was. Yikes! Stuff's just thrown in there. I kept buying multiples of things cause I didn't know what I had. No good. And now the afters. Ahh...it's like a breath of fresh air. I open my pantry now just to look at it in all of its organized glory. I didn't go out and buy any containers--I just used what I had including a bunch of canning jars that I utilized for some smaller items. We also had a couple Ikea Komplement wire baskets lying around that we put to good use in here. 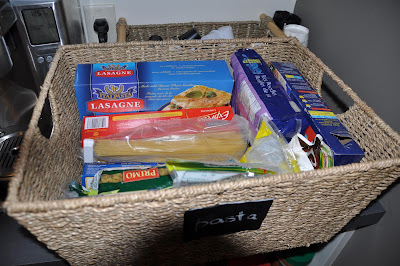 Using baskets is the perfect solution for organizing snacks and cereal boxes as well as other containers that have the tendency to take over a pantry. Thanks for featuring my pantry Kat. Yours turned out so well. I love the vintage pretties you included and the mason jars. Great job. Great job on the pantry! I love the bins you stored things in! Very well organized! 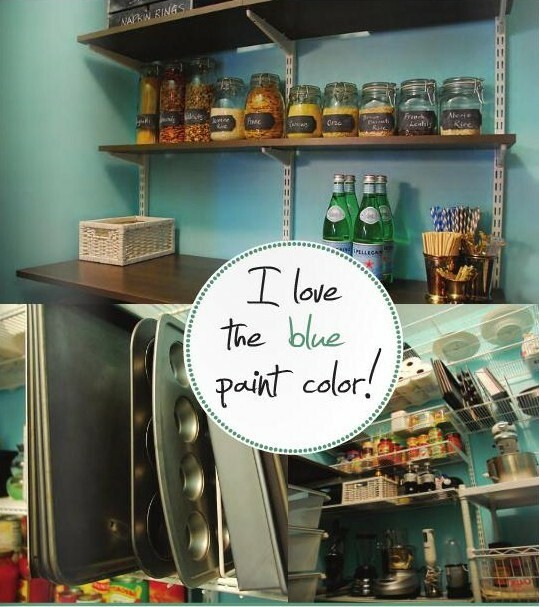 And you also showed some other great pantry ideas. 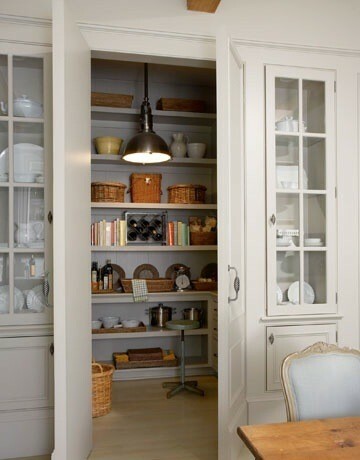 I love the idea of having outlets inside the pantry! Wow your pantry looks great, I love the jars and coke box! I love the blue pantry with the bib rack, so cute! Wow! That was such a big job and now I'll bet you are really enjoying the new organization. Looks great! Love the inspiration photos too. Thank you so much for featuring Dina's pantry as seen in House of Fifty!! You did a great job organizing your pantry, can you please come to my house next?!? I just did a post on pantries too and none of the images are repeated...love that! How NICE NICE NICE are you to include our pantry. It is so helpful having small appliances in there. My teenaged son makes smoothies in the blender almost everyday. I can make whipped cream for a dinner party without the mess on the kitchen counter...although it is just steps away. But THEE most organized pantry is YOURS! I need to get to work with the cans, crackers, pasta, etc. I am inspired. 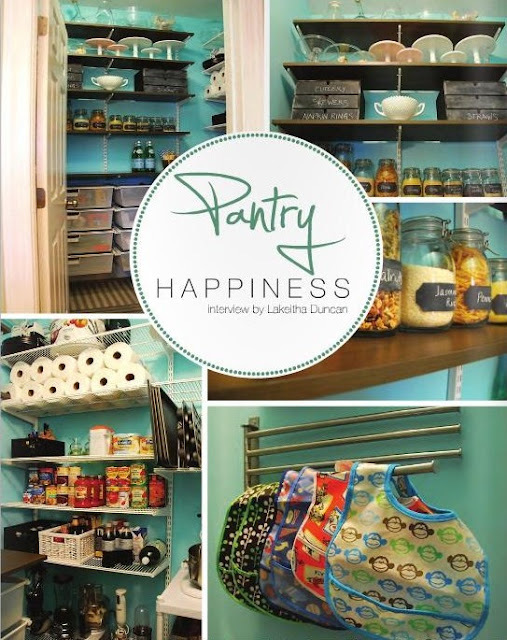 Hey I was just coming over to tell you AWESOME job on the ottoman featured on Remodelaholic and SURPRISE oh happy day to see you featured our pantry. Yours is way more organized than ours (love the coke tray)...I am inspired or perhaps shamed into working on our shelves now.